The story behind the name: Hydrus, the water snake, was noted by Dutch navigators Pieter Dirszoon Keyser and Frederick de Houtman who charted the southern skies between 1595 and 1597 on a voyage to the East Indies. 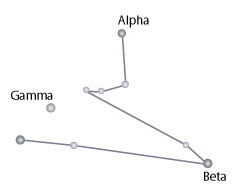 The constellation was introduced by Johann Bayer in his 1603 publication Uranometrica. Hydrus resembles a rearing snake, with its head erect and body twisted into a sinuous shape.